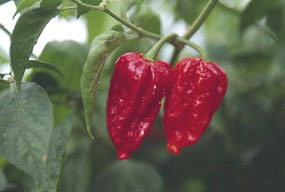 Habanero chillies such as Dorset Naga need a long growing season. Peppers – that is chilli peppers and sweet peppers – are frost-sensitive perennials normally treated as annuals in Britain. Growing peppers can be tricky, especially without the correct equipment, but by following a few rules it becomes straightforward, and raising productive, healthy plants is immensely satisfying. Peppers require more heat and are slower growing than tomatoes, and must be sown early. A sowing date of February to March is recommended, though for slow growing types, such as the habaneros, the sowing date can be moved forward to the middle or end of January. Seed should be sown onto a fine-grade seed compost and covered to a depth of 6mm. 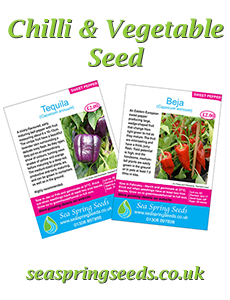 Traditionally, seeds are scattered thinly into flat trays, but they can also be sown individually into small modules. The compost should be kept at a temperature between 21˚C to 32˚C (27˚C is ideal), and watered so that it does not dry out. Germination is relatively slow and protracted, and can take place in the dark. Once the first seedling has emerged, however, they must be exposed to light to prevent spindly growth. Using a propagator is the best way of keeping the temperatures high enough. 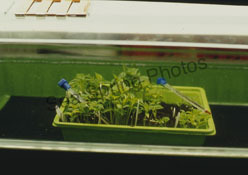 Propagators with a thermostat are ideal, as it is simple to maintain the desired temperatures. Cheaper propagators have no thermostat and temperature is just controlled by a dial, in this case a simple thermometer stuck into the compost can be used to monitor the temperature. After germination, ideally seedlings should be grown on at temperatures of 20˚C to 26˚C during the day – using the lower temperatures on cloudy days – and 16˚C to 18˚C at night. 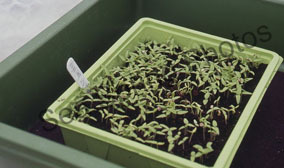 If sown in flat trays, the seedlings should be pricked-out after the cotyledons (seed leaves) have fully extended and the first true leaves are emerging, and transplanted into 9 or 10cm pots filled with multipurpose compost. However, timing is quite flexible, and pricking-out can be done anytime up to the development of the fourth true leaf. Alternatively, seedlings grown in modules can be transferred, compost and all, into pots when the cells are filled with roots. In both cases, the seedlings should be planted deeply, almost up to their cotyledons. As the young plants grow they need to be regularly watered, and once the nutrients are used up, they should be given a complete liquid fertiliser. Compost temperature should match the air temperature, so any water and liquid feed given to the plants must not be too cold. A pepper plant is ready for transplanting to its final growing place when its roots have filled the pot without being pot bound; ideally this will also be when its first flower bud has formed. This could take about 8 weeks after sowing, though, in practice, it will vary considerably depending on germination speed, growing conditions, cultivar and species. Even then, it is not a problem if the timing is off and the plants are less than the ideal: both younger and older plants will respond well to transplanting. Though some chillies can be cultivated outdoors, especially in the south of Britain, they all grow better in a protected environment like those found in tunnels, greenhouses and conservatories. Even a sunny windowsill in the house can produce good results with small-statured varieties. If these structures are unheated, however, transplanting must be delayed until after the risk of cold weather. In southern Britain, conditions are generally warm enough from the latter part of April to the beginning of May, with the dates becoming later for gardens further north and at higher altitudes. Chillies are can be grown in the ground or pots. If grown in the ground the soil should be well-drained with a pH of 6.0 or above. Plants should be spaced 45 to 60 cm apart in single or double rows. If fertility levels are low, a solid complete fertiliser should be incorporated just before planting ­– pelleted chicken manure is a good choice since it slowly releases its nutrients throughout the growing season. If the soil is well-composed and fertilised the plants may need no further nutrient supplementation. Using compost-filled pots is an alternative to planting in the ground. The pots should be at least 22cm in diameter for larger varieties, though smaller pots will do for short and compact varieties. As chillies like to have their root grow down deep growbags are less good for chillies. Special attention must be paid to watering plants in containers since they will dry out quicker than those grown in the ground. Fertility is also an issue, and the plants should be fed a complete liquid fertiliser every week or so when the nutrients get low – starting perhaps the first month after transplanting. Tall-growing varieties and those with large fruit will need some sort of support to hold them upright and stop their branches from breaking. Where plants are grown in the ground the ideal method is to suspend string from the top of the tunnel or greenhouse and twist it around the plants’ main stalk. However, where this is not possible or when plants are grown in pots, three bamboo canes tied into a tripod do a good job. Further support may be necessary for individual branches of the big-fruited varieties. The colour of chillies varies with the variety and stage of ripeness. Unripe fruit are normally shades of green, but occasionally are pale yellow, hues of purple or a mix of the two. Once the fruit have reach their full size, their colour starts to change as they ripen. Most turn red, but some ripen to a yellow, orange or even a brown. The fruit can be harvested either unripe or ripe, provided they have reached their full size. With some varieties picking can begin in July, but it is more likely harvesting will start sometime in August. Leaving too many fruits on the plants reduces yields, and the more the plants are picked, the more they will produce. Chillies are remarkably trouble-free and are seriously threatened by only a few pests and diseases. Though red spider mite, white fly and thrips sometimes attack peppers, aphids (greenflies) are the pest most likely to be encountered in the home garden. Where just one or two aphids are seen on a leaf they can simply be rubbed off, while light infestations can be washed off with a jet of water. Pesticides and predators efficiently deal with heavier invasions. Tobacco mosaic virus is a potential problem controlled by banning smoking around the plants. Gardeners who smoke should wash their hands and wear rubber gloves before handling seeds and plants. Botrytis (grey mould) appears in late autumn, though by then most of fruit will have been harvested. Growing conditions can also affect the yield and quality of the fruit. High temperature stress, for example, can cause flower drop, while blossom end rot, a physiological disorder caused by a calcium deficiency in the fruit, is exacerbated by a low pH and uneven watering. Bosland, P. W., and E. J. Votava. (1999) Peppers: Vegetable and Spice Capsicums. Grower Guide No. 3, 2nd Series. (1995) Peppers as a Commercial Crop. Grower Books. Swanley, Kent.